NHRA Funny Car driver Tommy Johnson Jr. is restless and wants the 2019 NHRA season to begin now. If you look at his long and illustrious career, you’ll understand, as he’s been racing for most of his life. At age eight, Tommy was competing on motorcycles at his local Iowa track and continued to race on two wheels until he was 14 years old. Soon after, he had the urge to drag race, and when he turned 15, Tommy became the youngest driver to earn an NHRA competition license. Tommy moved up the Sportsman classes, starting in Super Gas, then on to Super Comp, always improving his skills as a driver. Eventually, Tommy wound up racing a Top Alcohol Funny Car, just one step down from the Nitro category, but that’s all it took to solidify his racing career and push him to get a full-time ride in the professional Nitro classes. Tommy would eventually take over the reins of the Mopar® Xpress Lube Top Fuel Dragster in the early 1990s, but it wasn’t until later that he’d taste victory as his abilities and talents as a competitor improved. In 1993, Tommy captured his first NHRA professional win at Seattle and was runner-up two weeks later at Brainerd, Minnesota. From there, he was non-stop with numerous victories in both Top Fuel Dragster and Funny Car for the next 25 years. For having such a competitive nature, it’s easy to see why Tommy is ready to get back in the seat of his Don Schumacher Racing (DSR) Make-A-Wish Dodge Charger R/T Funny Car sponsored by Doug and the late Terry Chandler. Despite coming very close to a championship finish, Tommy Johnson Jr. wants to hit the throttle and get the 2019 NHRA season going. Looking back at 2018, Tommy Johnson Jr. had many highs and lows, as most racers do, but he was the highest finishing DSR Dodge Charger Funny Car among the pack. He was runner-up at the season-ending NHRA World Finals in Pomona, California, and that’s a very good way to end the season. For his efforts, Tommy Johnson Jr. got a nice bonus from Dodge. “It was a great weekend (2018 NHRA World Finals), we just came up a little bit short. I’m proud of my guys; we had such a strong racecar. To come out to Pomona and finish the season third in points, it’s hard to be ashamed of finishing third so, I’m extremely happy. You always want a better year, unless you’re number one, but all in all, not a bad year. I thank Dodge and Mopar® for putting that 2019 Charger SRT® Hellcat street car on the line for the highest finishing DSR Funny Car driver. That certainly was in the back of our mind and we’ll put it to good use this year,” grinned Tommy. Coming off a great finish at the last drag race of the year, Tommy Johnson Jr. took some time off to celebrate the holidays, but it was still business as usual in preparing for the 2019 season. There really is no “off-season” for him or the crew as they use the time to go through the car and all the support equipment to run the intense 24-race schedule. Luckily for Tommy, his machine was well “dialed-in” toward the end of 2018. “In the off-season, we didn’t do a lot; we front-halved our chassis and upgraded to a new Dodge Charger [SRT] Hellcat body and that’s pretty much it. Our car ran so well last season that we didn’t want to change too much. I definitely want to start the countdown higher and the ultimate goal is to win it. 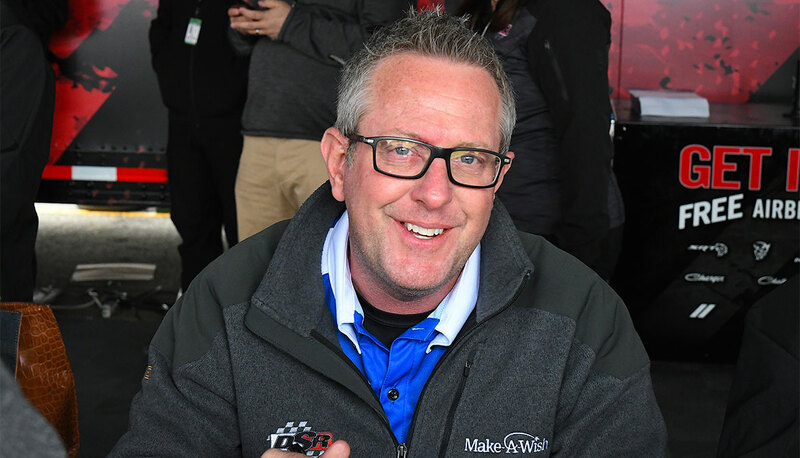 I’ve been third three times, been second and sixth in the past five NHRA seasons, so only place I want to be now is number one,” commented Tommy. The annual NHRA Winternationals is coming up as fast as a HEMI® engine-powered Funny Car hitting on all eight and blasting off the starting line. With Auto Club Raceway being hallowed ground for racers, it shares a special place in Tommy’s heart. Ask any Pro or Sportsman driver which NHRA event they’d like to win and the Winternationals is in the top three. Winternationals has a rich history that spans over the past five decades. Tommy Johnson Jr.’s name has been cemented in history as a former winner blasting down the iconic stretch of pavement, something he is very proud of.